Setting off mid-morning from Skukuza Rest Camp in Kruger National Park on a self-guided safari had Bob and me filled with anticipation. 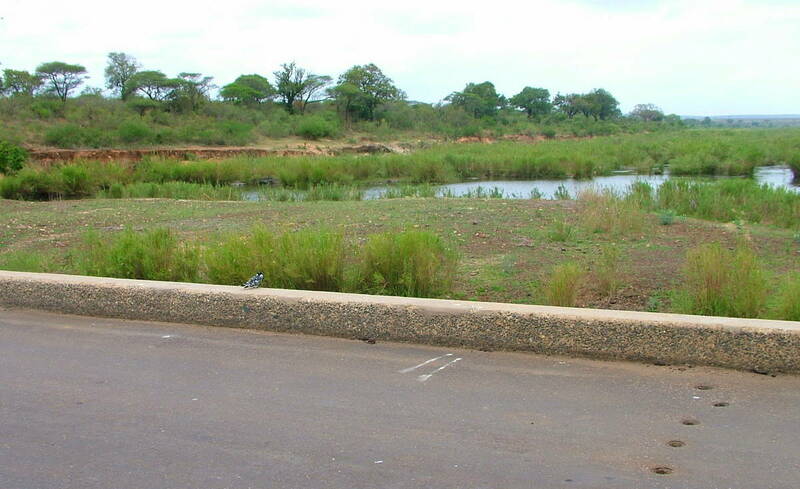 Our destination for the afternoon was Sunset Dam near Lower Sabie Rest Camp, a mere 36 kilometres southeast of Skukuza. The generous waterhole at Sunset Dam rewarded us with prime wildlife viewing that included this family of Hippopotamuses. admiring a Lilac-breasted Roller delayed our progress even further. At first, the bird defied identification by we birding novices, but I finally figured out that the dark band around its neck was caused by a shadow from a nearby tree branch. 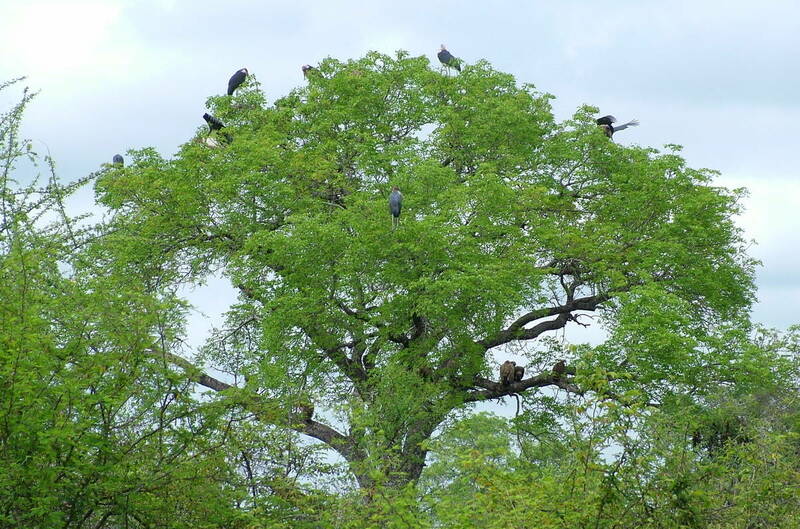 and Marabou Storks decorating a broad-leaved tree had us pulling to a stop in order to count the unique large birds. There were about 20 in amongst the foliage. These large gregarious birds are often seen in large groups that assemble to roost for the night. What really struck Bob and me was the enormity of each bird’s bill and bald head. 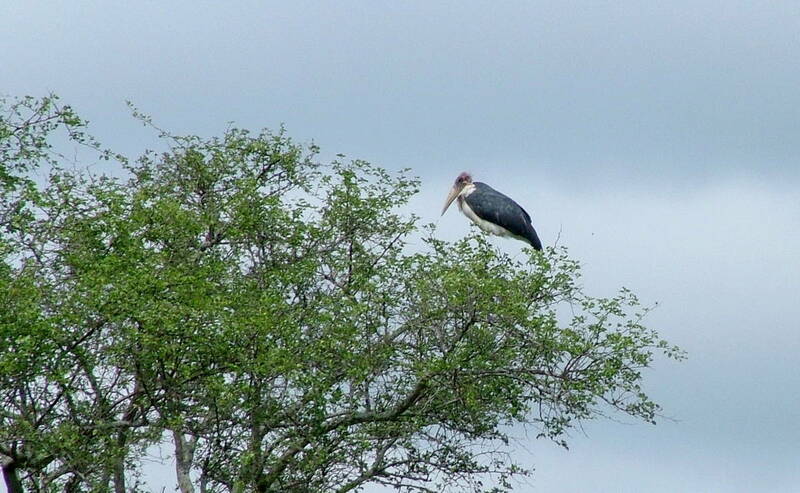 Marabou Storks frequently scavenge on carrion, as well as any animal matter dead or alive that they can swallow. 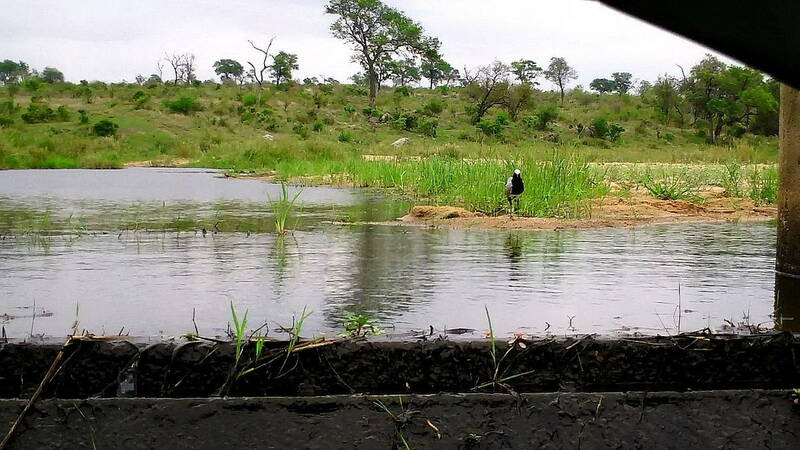 With a wingspan of up to 10 feet and a standing height of 5 feet, Marabou Storks are very large birds. Upon arrival at Sunset Dam, we discovered that it is possible to drive right onto the beach of the waterhole for an unimpeded view of the water and surrounding shore. There were a couple of other vehicles already in position, so we sidled up between them, rolled down our windows and waited. 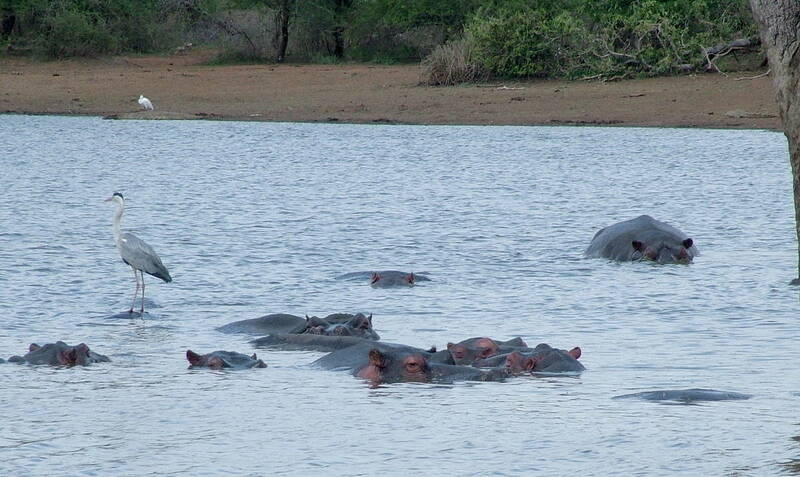 and immediately realized that the water was alive with dozens of Hippopotamuses. Other than their ears, eyes and nostrils visible above the surface, the ridges of their spines were also showing while the remainder of their bodies were submerged. 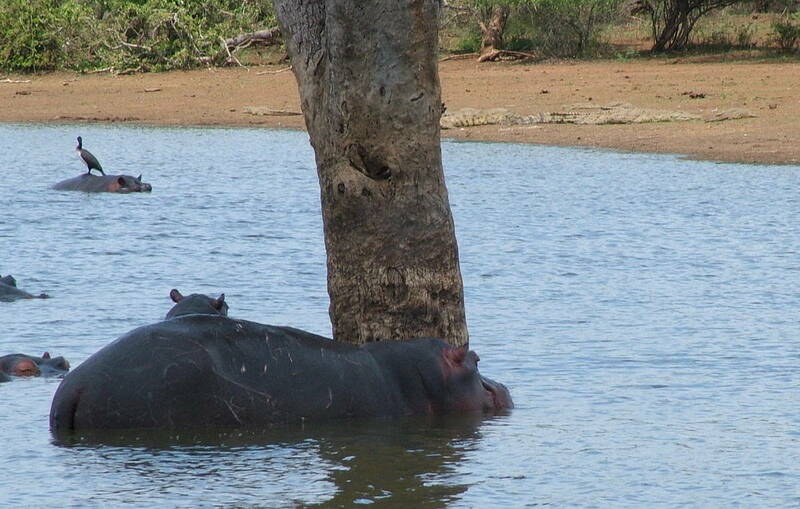 This is the customary way that Hippos keep cool under the brutal heat of the African sun. 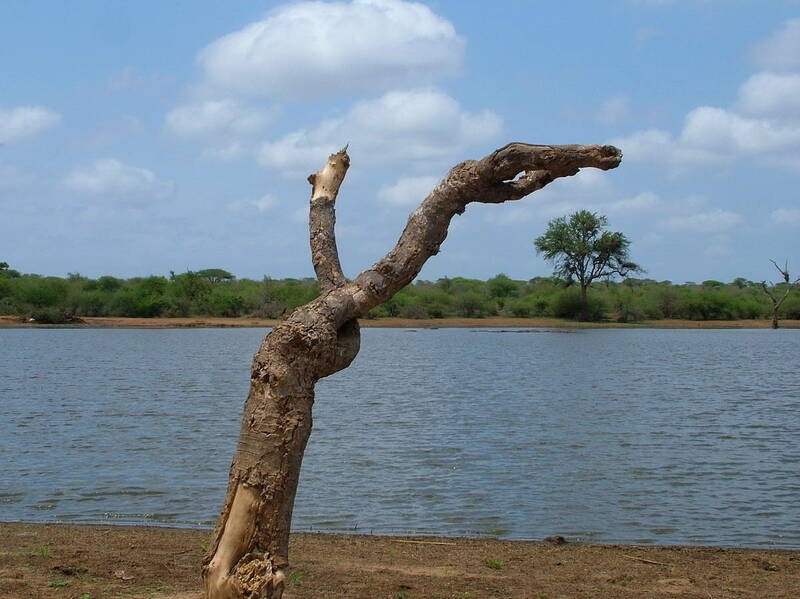 A long-dead tree stood solitary closer to our side of the waterhole, and another group of Hippopotamuses had gathered near its trunk. 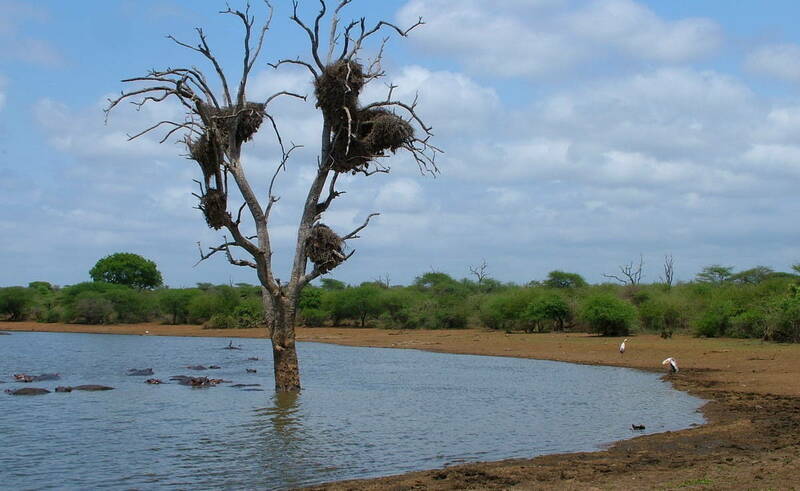 Set in the pond directly in front of our car, the tree also supported the remnants of nests built by Red-billed Buffalo Weavers. 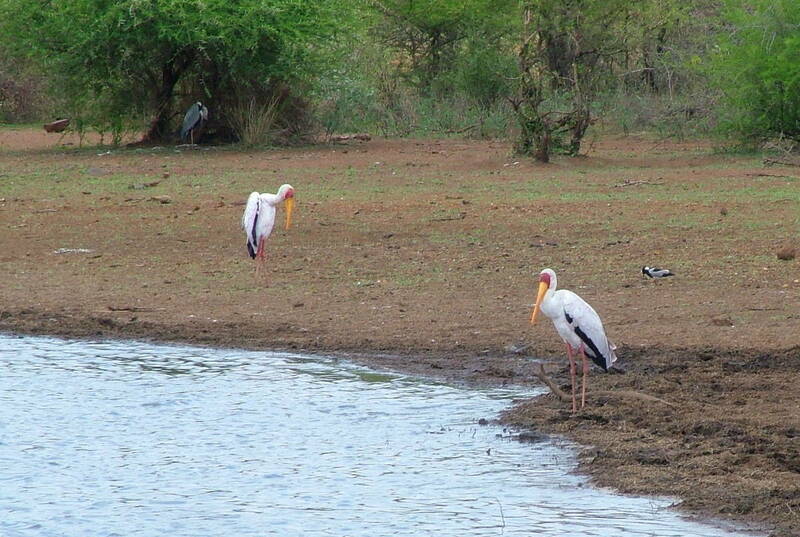 As Bob and I scanned further afield with the binoculars, we identified three Yellow-billed Storks on the beach not far from the tree. 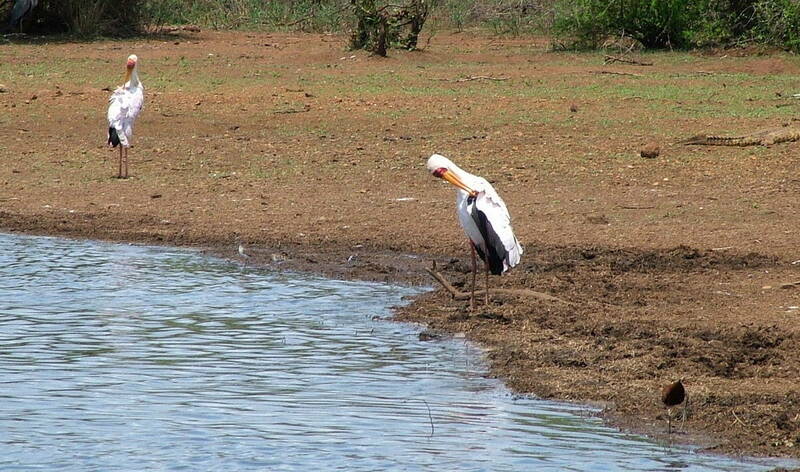 Yellow-billed Storks stand about 40 inches tall, so they are no small birds. This species breeds during the rainy season, and in preparation for that, the plumage on their upper wings and back will turn pink, plus the red of the face and yellow of the bill both deepen in colour. We could detect a pink flush on the back of one bird, and noted that their legs had already turned from brown to pink, another indication that mating would soon begin. 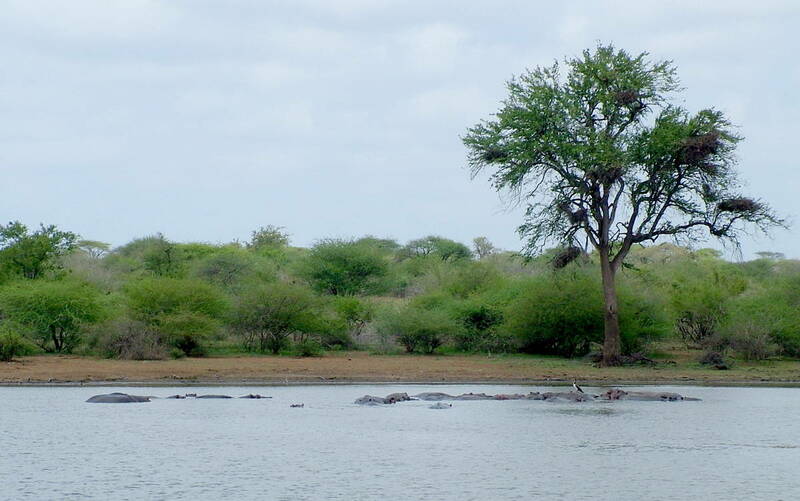 We had a dandy view of the Hippopotamuses and realized that each group or pod of them included a territorial bull supervising the young and cows in his appointed section of the waterhole. 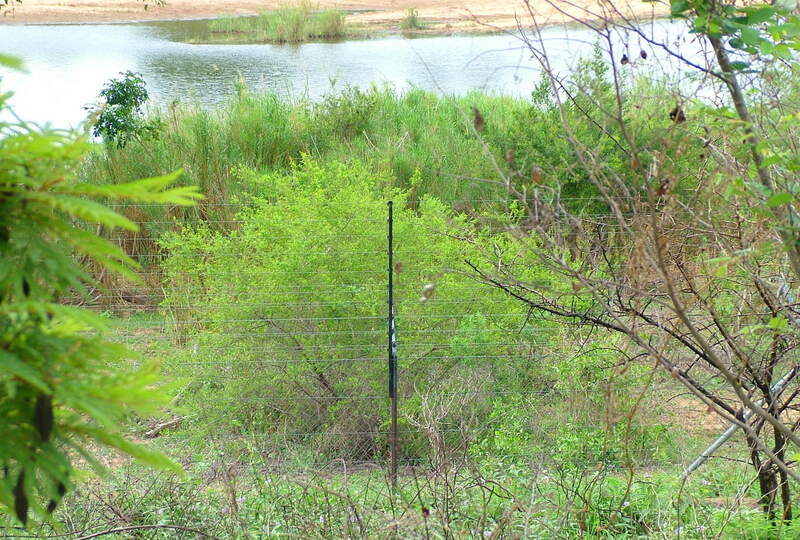 In a small pond or lake with partitioned territories, a pod numbers between 10-15 animals. These enormous herbivores do not emerge from the water to graze until around dusk, and oddly enough, the bulls display no territorial concerns once on dry land. 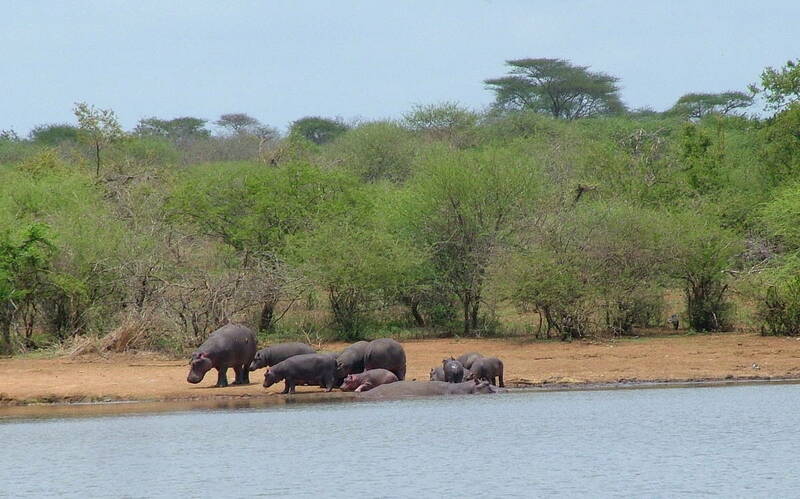 Hippopotamuses then split up and graze individually on grasses. 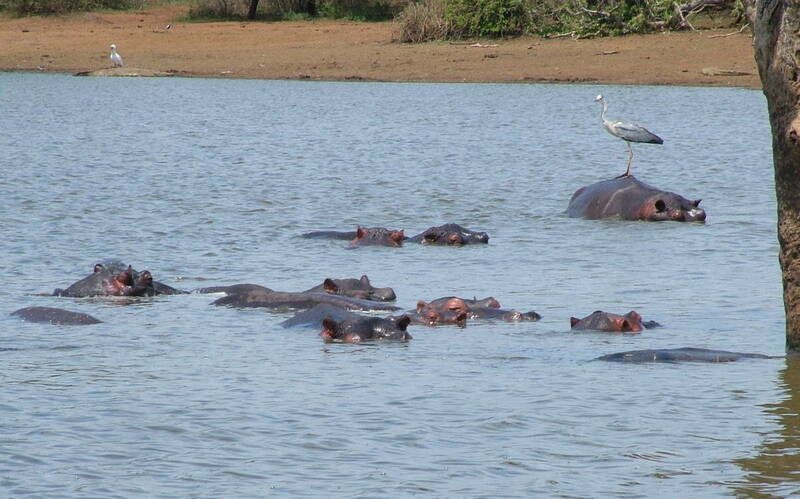 Bob and I were quite taken with the Hippos and waited anxiously for some drama to unfold. 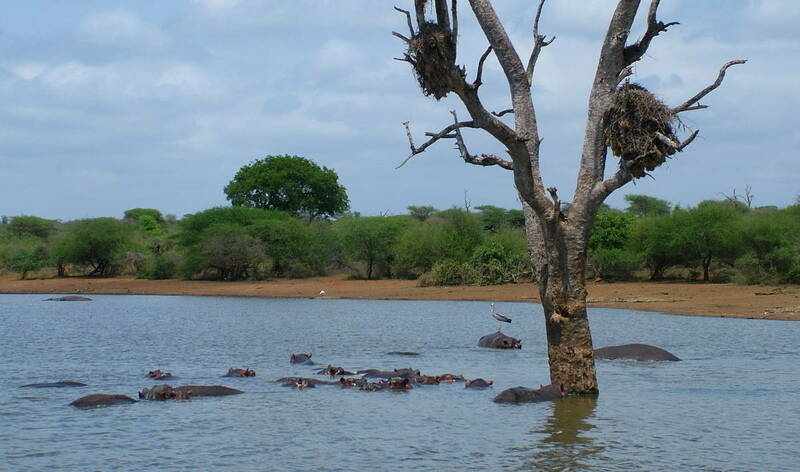 By times, the water was boiling with boisterous and often retaliatory actions by one or many hippos at a time. Here, we see a typical Hippo yawn. 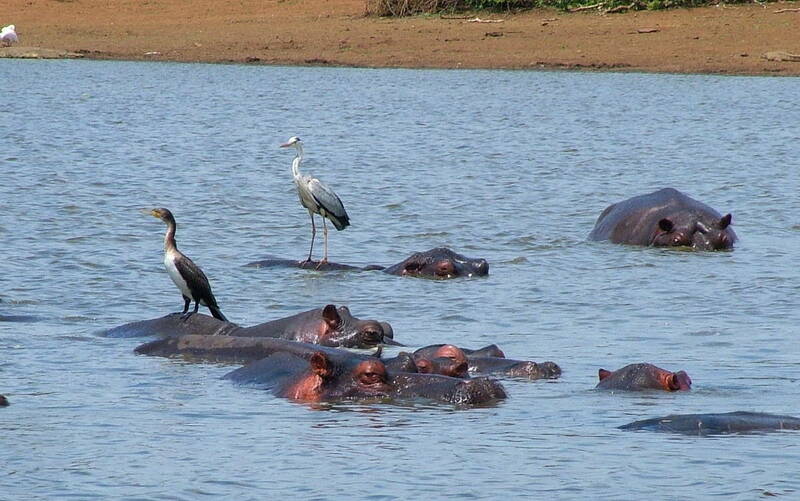 The Hippopotamuses’ partially submerged rotund bodies made a great spot for different birds such as this Grey Heron to perch. 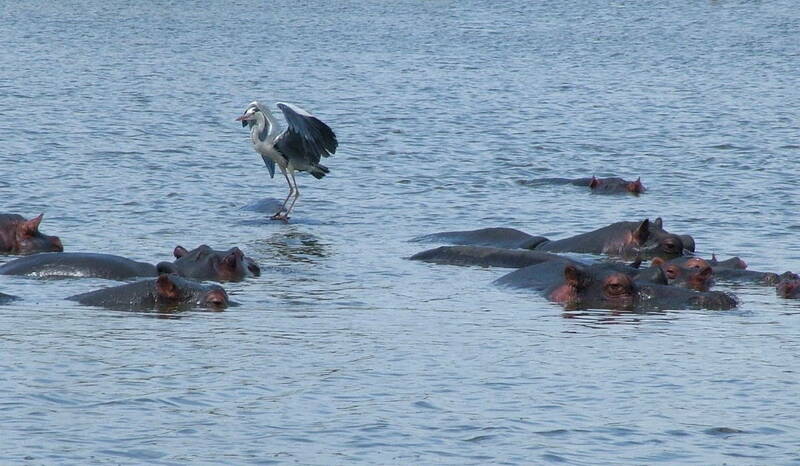 When a Hippopotamus dips beneath the water’s surface and begins to walk along the muddy bottom, amphibians and fish are disturbed, so the Grey Heron’s location made for an ideal spot from which to hunt for prey. More than one species of bird had the same idea. 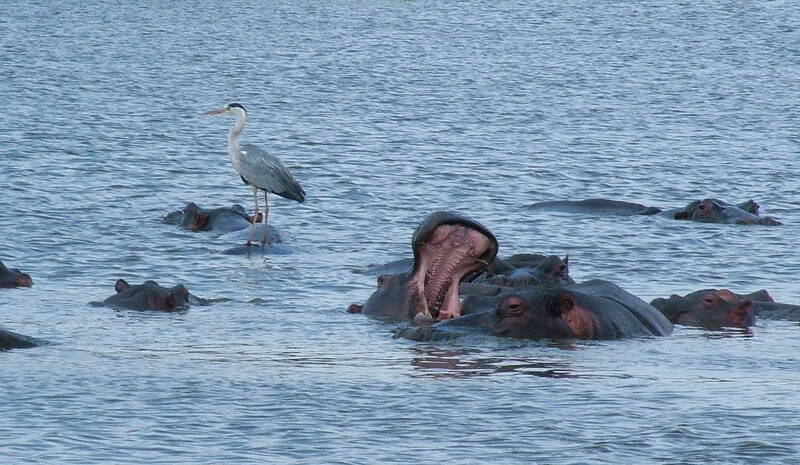 An immature Reed Cormorant soon took up a position on the back of a neighbouring Hippo. We had to chuckle when, at times, it appeared as though the birds were walking on water as they sailed along on their unseen hosts. 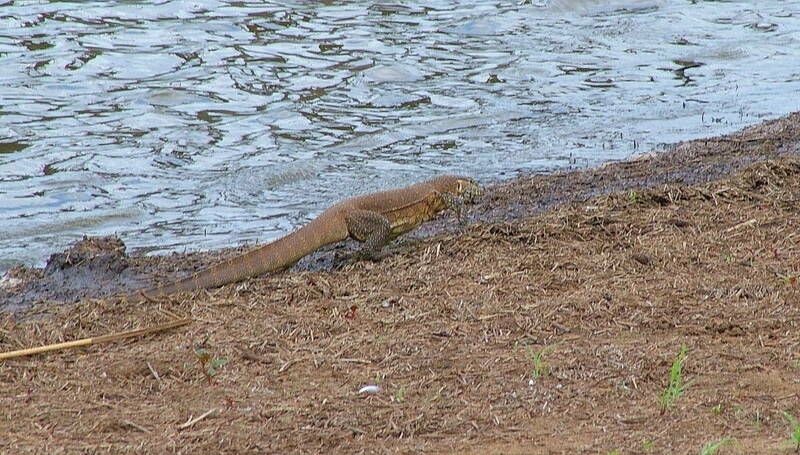 It was along about that time that I took a closer look at the rust-coloured sand that bordered the waterhole. 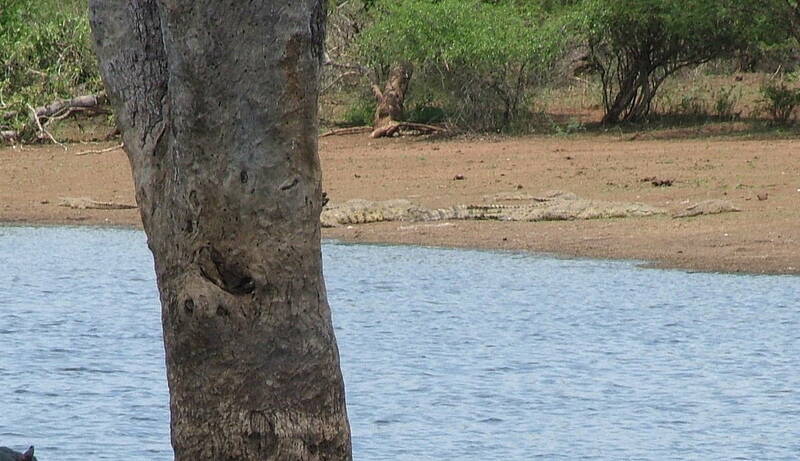 I nearly fell over when I realized that the beach was littered with Nile Crocodiles so well camouflaged that we had overlooked them totally. Nile Crocodiles are the second largest reptile in the world, and there, within a couple hundred feet of our car, lay about a dozen of these bronze-coloured predators that would think nothing of tackling a young Hippopotamus or most any other animal that might happen by when hunger strikes. 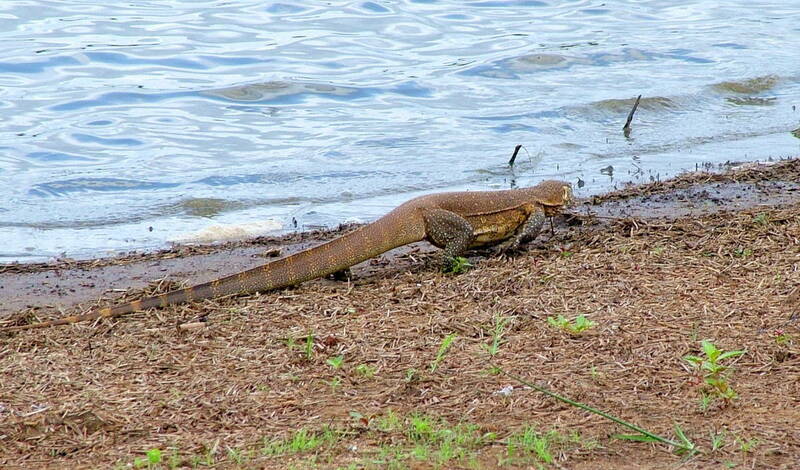 Thinking then to take a look at the sand beside my car door, I couldn’t believe that a large Water Monitor was sauntering along the edge of the water no more than 5 feet from me. 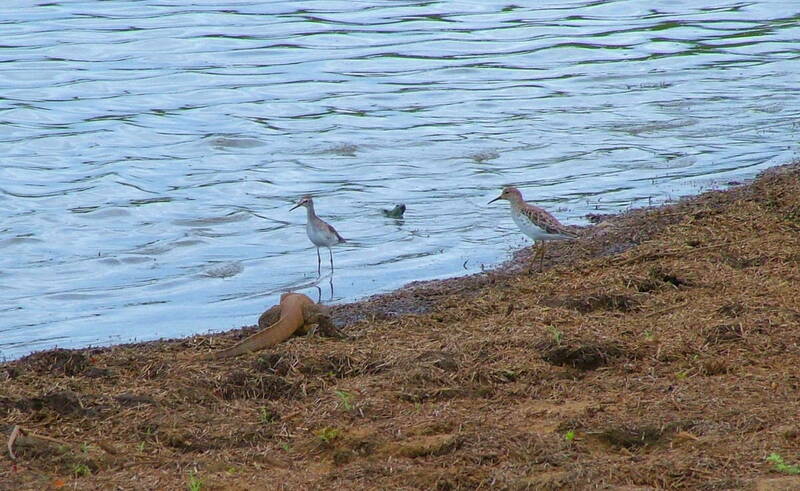 then proceeded to enter the water while two Sandpipers looked on, totally unfazed by the reptile despite it being a notable predator. 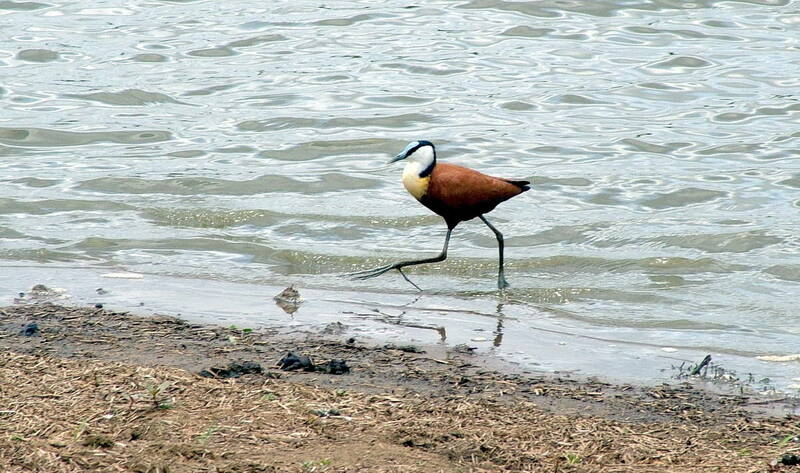 The next thing we knew, an African Jacana came strutting down the shore looking as if it was on a mission. While it waded in the shallows, Bob and I could readily see the long toes and claws spread wide, a trait that allows these birds to walk on floating vegetation. 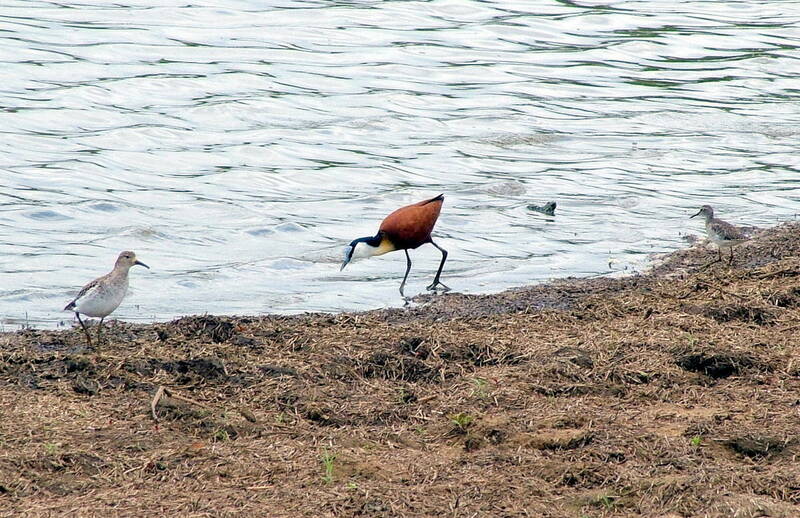 The African Jacana joined the two Sandpipers by which time the Water Monitor had disappeared below the surface of the water away from the burning rays of the equatorial sun. The shore and water must have offered a tempting assortment of insects, invertebrates, snails, etcetera because the three birds foraged side by side for a long time. 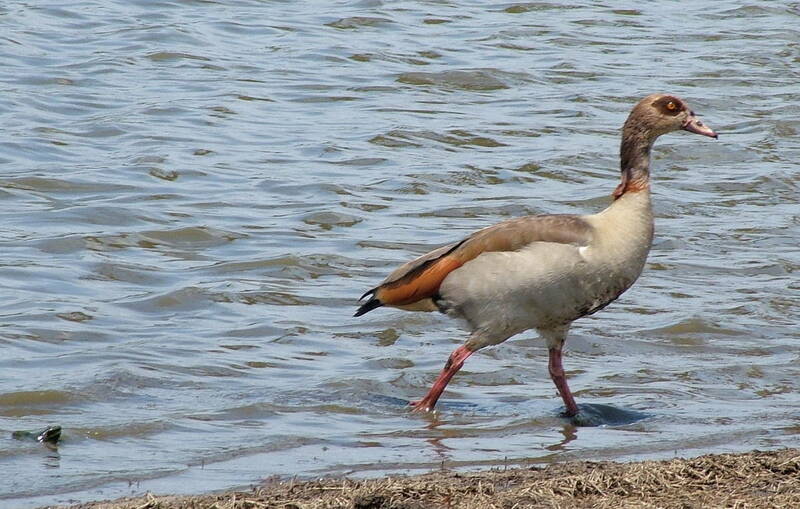 Next to join the party was an Egyptian Goose although this bird would not be competing for the same food since vegetable matter makes up a large part of its diet. Bob and I were in awe of the variety of birds and animals so close at hand. It was close to lunch time when Bob and I decided to make our way to Lower Sabie Tent Camp for a chance to exit our cars and stretch our legs. 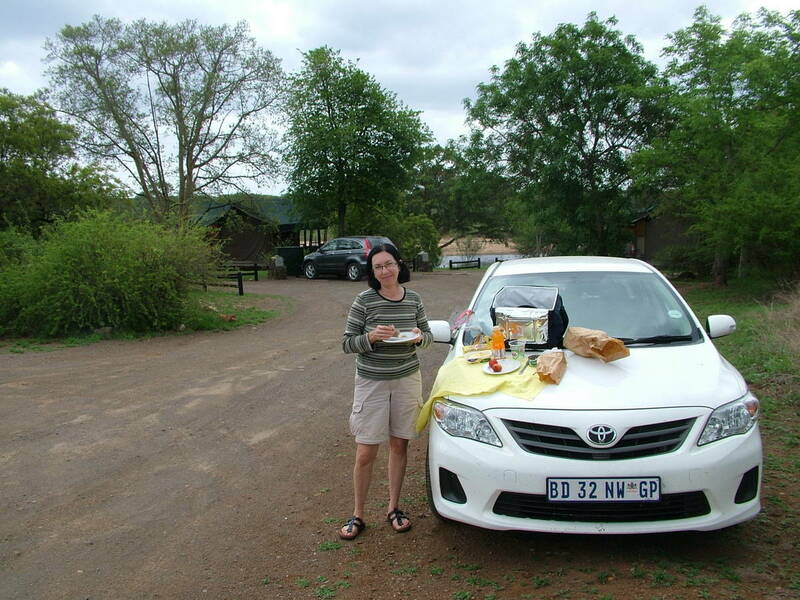 It was a mere kilometer further and the timing would work for us to also enjoy our picnic lunch. 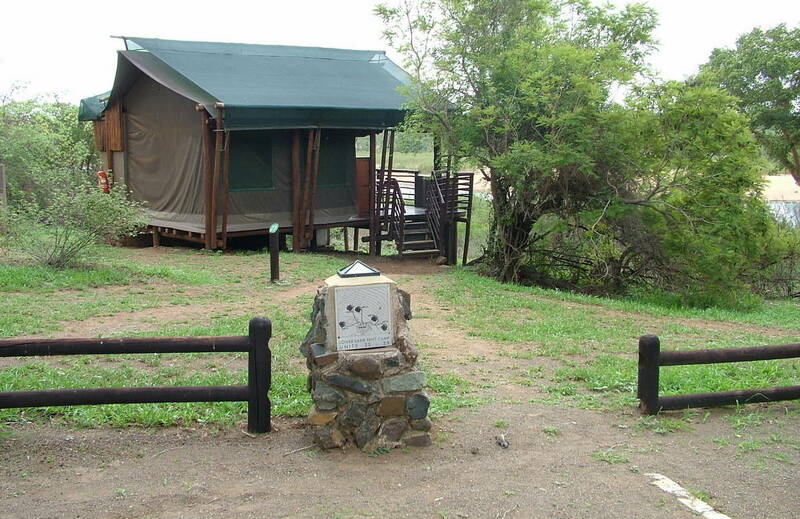 A view of the Sabie River was possible from within the Rest Camp. 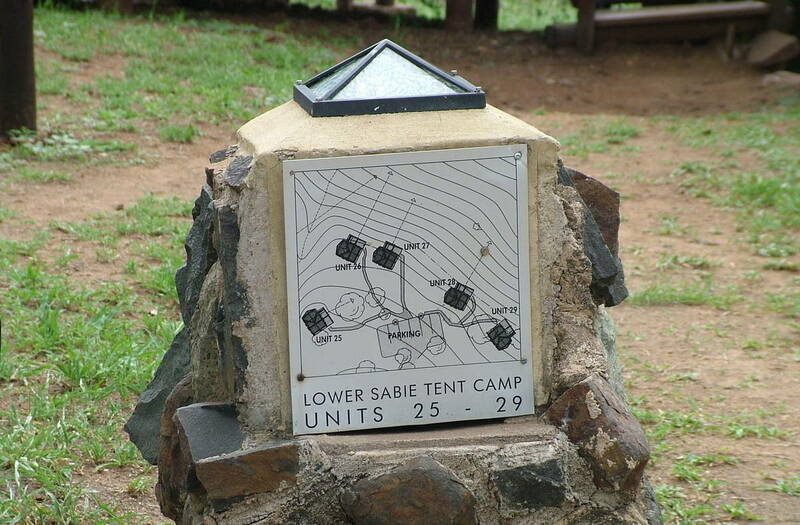 Like at the Skukuza compound, Lower Sabie offers a variety of accommodations. 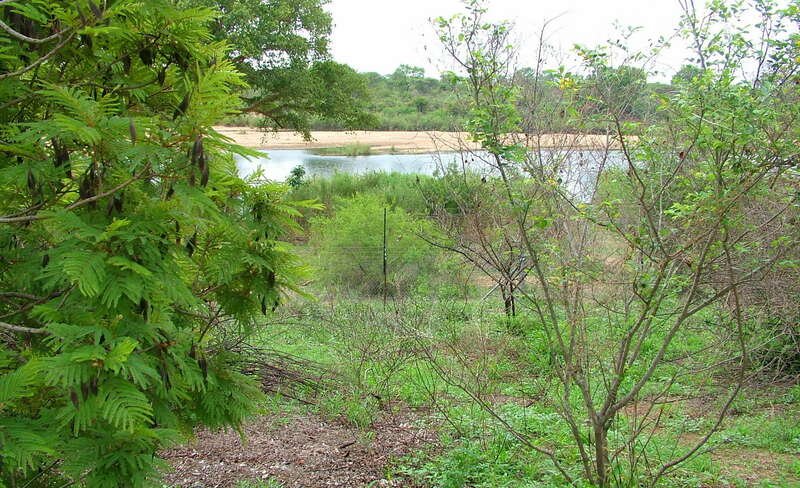 Its proximity to the Sabie River makes it another ideal location to spend some time because large numbers of animals are attracted to the river and corresponding riparian habitat. 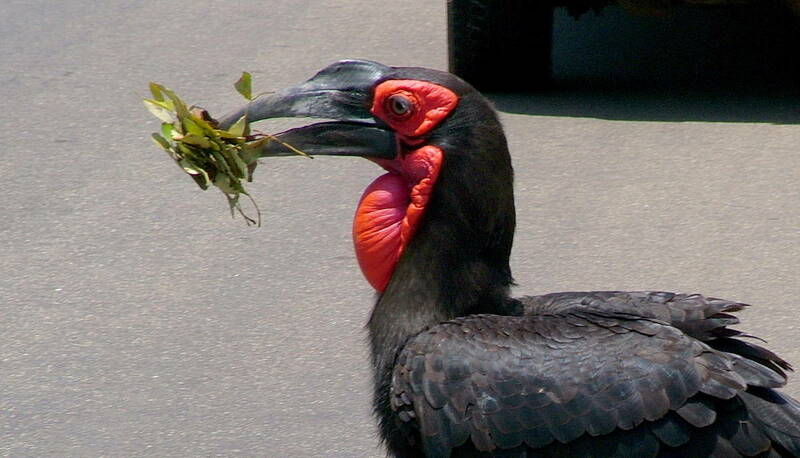 Bob and I confidently exited our vehicle and took the opportunity to stand awhile as we ate our modest picnic lunch. In Kruger National Park, it is recommended to always carry with you sufficient water and food in case any problems arise that might cause you to be stranded for a time. 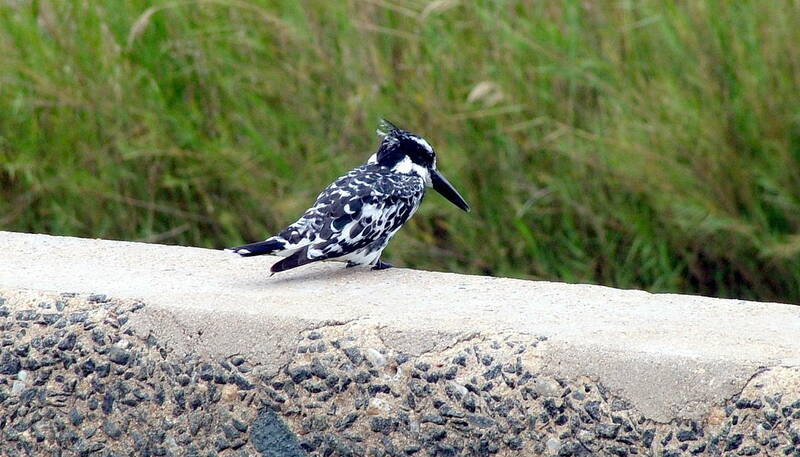 a beautiful Pied Kingfisher that was surveying the water below its perch. 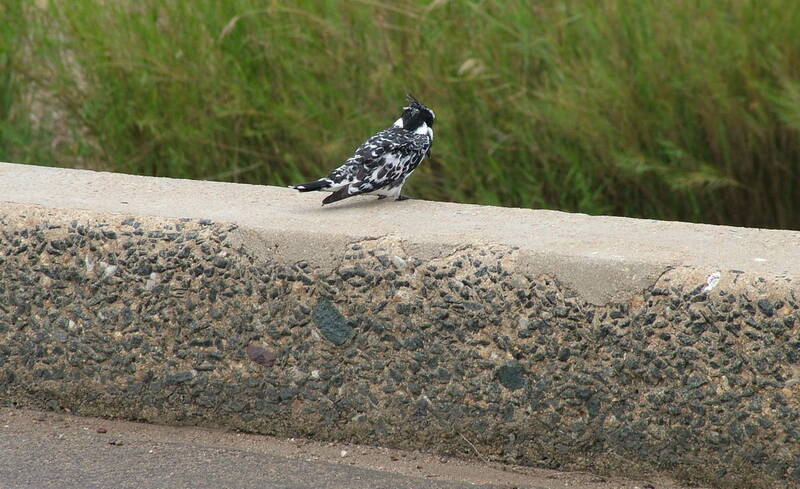 The black and white plumage allowed for quick identification assisted by the recognizable crest. I hastily rolled down the passenger-side window and took a couple of quick shots before we had to move further along rather than block the bridge. 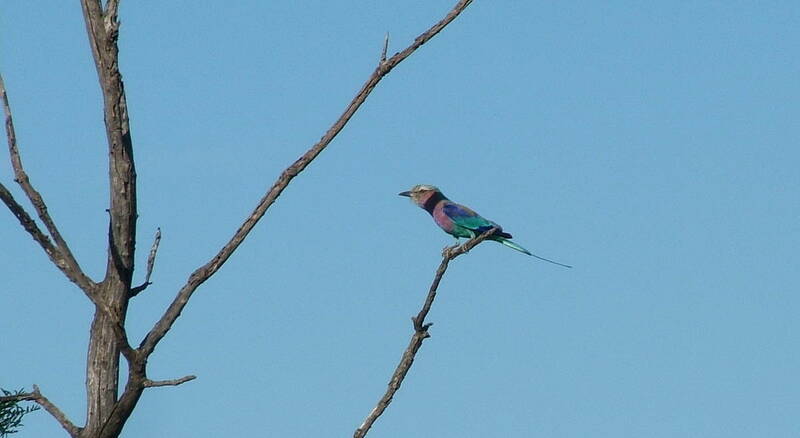 Another interesting bird that caught our eye as we left the Sabie River behind was a Blacksmith Lapwing. In the hours ahead, we would get much better views of other members of this species, but for that moment, it was another one that we could check off on our list. 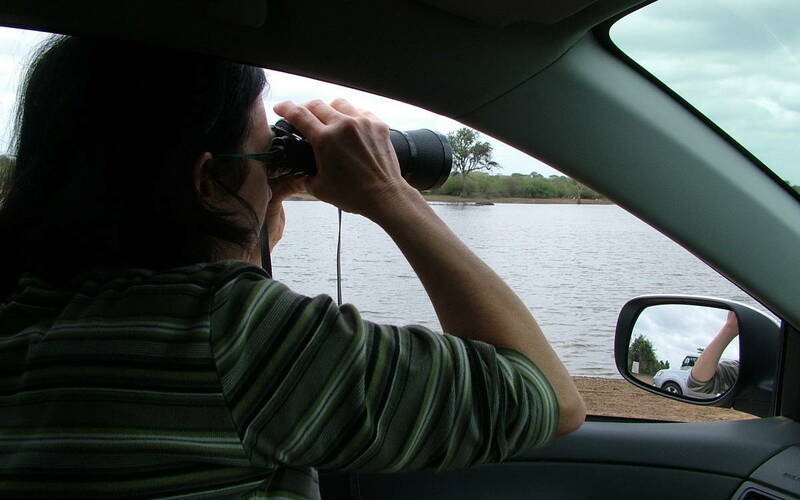 The visit to Sunset Dam and the area near Lower Sabie Rest Camp had been very successful in our eyes, but we were excited to see what new discoveries would be made on our return trip to Skukuza Camp. 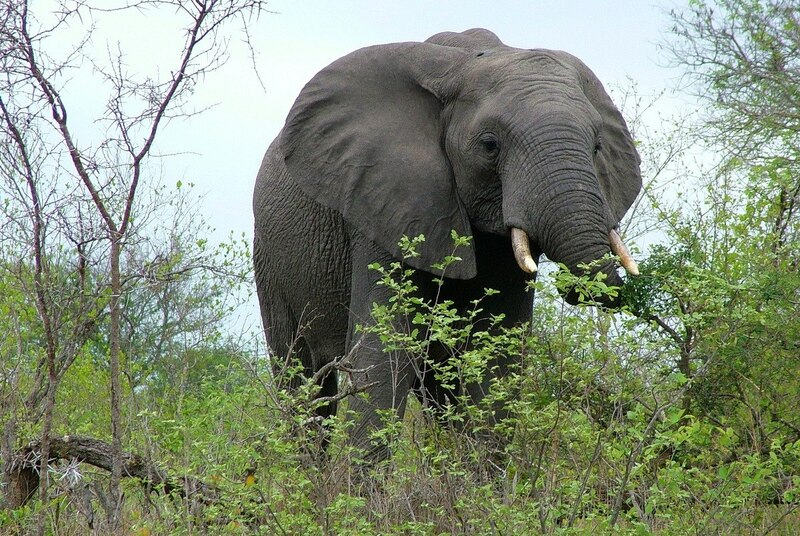 Explore Kruger National Park holidays and discover the best time and places to visit. | In terms of wildlife, Kruger is one of the world’s greatest national parks.I think Undoubtedly the best way to experience the Kruger Park is to have one’s own vehicle in which to travel around. 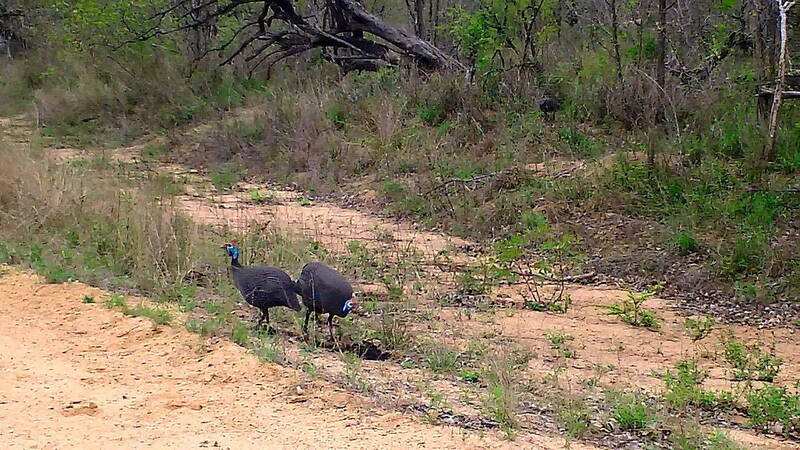 A Kruger Park self-drive safari gives.